Flappy The City Flyer is a simple arcade game we've all played recently. Help the bird collect seeds across the city and avoid all the obstacles while trying to survive for as long as possible. Along the way, there will be several buildings which the bird will need to dodge by flying higher or going lower. As for the controls, you already know the deal: tap constantly to make the bird fly and release the finger to make it fall, depending on your objective at a particular time. Graphics are simple but appropriate, well-designed and appealing. Controls are responsive and game isn't as challenging as others of the samy kind but equally fun. Markku Virtanen is the developer of Flappy The City Flyer, an unoriginal but always entertaining copy of that popular game which disappeared a few weeks ago. It's a dinner time for our adventurous little bird and it's hungry for cookies! 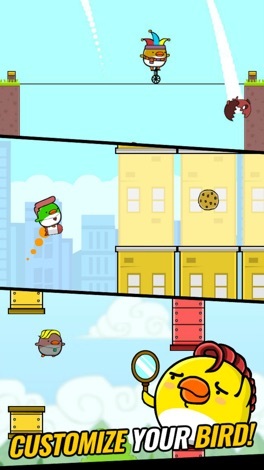 Guide Cookie Bird through dangerous obstacles and complete challenges to earn those cookies! What are you waiting for?! Let's go get those cookies! 3 Different game modes and more coming! Power-ups! Missions! Vehicles! 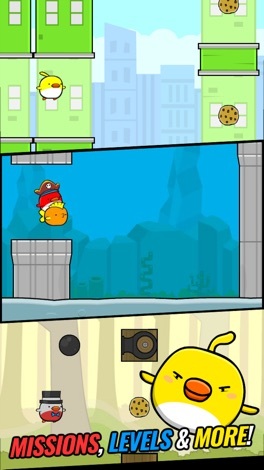 You can use the cookies you've earned to get accessories for Cookie Bird. You can customize Cookie Bird in numerous ways. Change colors, use hats, headphones, different hairstyles etc. etc. You also have over 100 levels to complete in the level mode. In order to 100% complete the level, you have to collect three stars from each level. Levels get harder as you progress! Have fun and thanks for playing our games! Greetings Lettu Gamers! Cookie Bird is back again and it's hungrier than ever! • Gameplay is simple and easy to learn as in all our games. 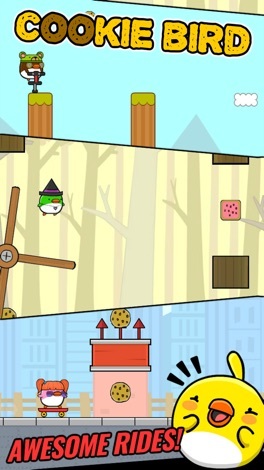 • Your task is to help the bird to catch the falling cookies. • You can you can customize your bird with different hats! Aim correctly, create matches and achieve a high rating. Bubble Birds is a simple and colorful appealing game with Adventure and Arcade game modes. The gameplay is well-known by everyone: remove all the birds from the screen in the fewest possible moves so you can achieve a three-star rating by dropping all the keys. However, graphics in this parti….